The Upload Dialog, opened by clicking the Upload icon , is used to upload images from your local machine to a chosen directory on the web server hosting your site. The Image Manager Extended includes options to resize and thumbnail images on upload. Click the Browse button and locate the target file or files on your computer. Multiple files can be selected and added. 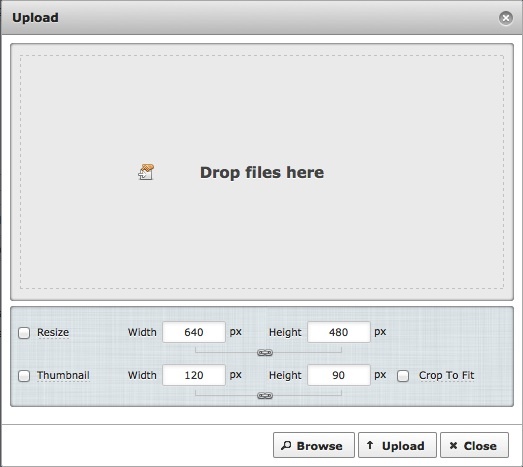 Alternatively, if the Drop Files Here label is displayed, drag the images from your local machine into the Upload dialog. The files will be added to the Upload Queue. You can edit the file name by clicking on it or by clicking on the Rename button to the right of the file name. The name can only contain the characters a-z, A-Z, 0-9, period( . ), underscore( _ ) and dash ( - ). Spaces are converted to underscores, all other characters are removed. To Resize the image, check the Resize option and set the Width and Height values if required. To create a Thumbnail of the image check the Thumbnail option and set the Width and Height values if required. Check the Crop To Fit option to fit the thumbnail within the given dimensions. The dialog will close automatically once uploading is complete if no error messages are reported.